As little as a decade ago, you could only realistically get multi-room audio if you were filthy rich. Multi-room audio systems were complex, usually bespoke, and required such dramatic changes to the fabric of your house that it was often simplest to implement when building from scratch. Installs usually required specialists, and since it tended to be only the wealthy who contemplated multi-room audio, the hardware options tended to the high-end. It was, all told, a pricey and disruptive business. The key technology for the iPhone is AirPlay. There are other options – Sonos, most notably, though some manufacturers can do clever things with Bluetooth, or you could consider peer-to-peer apps – but the big advantage to AirPlay is that it’s built right into the system. 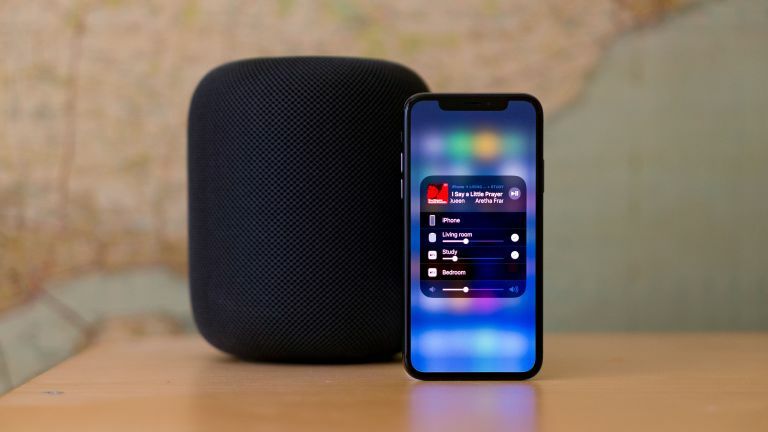 Generally speaking, you can send audio from any app or game through AirPlay speakers, whereas if you choose another system you will probably have to use a dedicated app, which can give you less flexibility. Unless this dedicated app specifically supports Spotify, say, you can’t play Spotify in your multi-room audio setup until the manufacturer does that deal and implements it. And actually, if you specifically want multi-room audio – rather than simply wireless audio streaming from your iPhone to just one speaker – then you have to use a speaker or other system that supports AirPlay 2, and it’s this new evolution of the technology that means we can properly talk about multi-room audio straight from your iPhone now. It’s supported on iPhones from iOS 11.4 – so that’s everything back to the 5s – and manufacturers such as Bang & Olufsen, Libratone, Naim, Beats and of course Apple itself with its HomePod are adding AirPlay 2 some to their speaker and amp line-up. Of course, you want to put a speaker in all the rooms of your house or flat where you want to be able to listen to music streamed from your iPhone, but here you have options. You could choose a speaker that supports AirPlay 2 itself internally; AirPlay 2 can be added by an update to older speakers, but we don’t anticipate many manufacturers will bother. Or you could use a fourth-generation or 4K Apple TV with speakers attached as an AirPlay 2 target. Or, most excitingly of all, Apple recently added AirPlay 2 to the firmware of its second-gen 802.11n AirPort Express base station; it has stopped manufacturing them, but they’re about £35 in CeX just now, and you can hook any speakers up to its output to instantly upgrade them to AirPlay 2 compatibility. It’s a great, cheap way to upgrade your house to multi-room audio. There is some potential confusion with speakers made by Sonos. Technically, AirPlay 2 and Sonos’s multi-room audio platform are different, but Sonos recently _also_ added AirPlay 2 support to the Sonos One, Beam, Playbase and second-gen Play:5. That means that if you have or buy one of these speakers, you can _either_ use it for multi-room audio from the Sonos app, or at system level using AirPlay 2. In fact, it gets even more complicated here. Other older Sonos systems aren’t AirPlay compatible, but if in the Sonos app you have grouped any older Sonos speakers _with_ one or more of the AirPlay 2-compatible speakers listed above, then you can use them with AirPlay. We’re assuming you’re working wireless here, but some speakers (or, say, one connected to an AirPort Express) can connect to your network over Ethernet, if you’re lucky enough to have cabling in your house. There are lots of ways to use Siri with AirPlay 2; you can use Siri’s suggestions – trigger Siri, wait, then tap the question mark – to inspire you to explore what it can do! Once you’ve bought and added your speakers, and named them to make it easy to know which is where, you can tap the AirPlay icon that appears in some apps, or tap/hold on the top right corner of the playback module in Control Centre, to bring up the audio routing interface. You can tap on one AirPlay speaker to send audio straight to just that one, or tap the check circle next to the name to choose more than one. You can set volumes independently. If your iPhone is too old, or your AirPlay speakers don’t support AirPlay 2, there is a workaround. The venerable iTunes Remote app still works, and you can use this to remotely control an iTunes library on a Mac or PC on your local network. Here, you can select multiple speakers, even if they’re only original AirPlay (or otherwise directly connected to the computer) rather than AirPlay 2. Now all you have to decide is what music you flood your newly wired-for-sound pad with. Crank up the Apple Music or Spotify, and to hell with the neighbours!